Continuing from my Focus Screen and Sensor Cleaning article which I had written when I had my EOS 5D, I saw an opportunity to follow it up with a more thorough post when a friend noticed a spot in the viewfinder. Having risked it all before on my EOS 20D, 5D and the 5D MkII I said I would take a look the next time he’s in town. So the day came and I knowing that he’s hands-on enough when it comes to small PC-related tasks such as handling screw drivers, I threw the ball right back at him and had him tackle the problem himself. It was a great learning experience for him and at the same time allowed me to document the steps we took to complete the job. I’ve divided this post into two practical parts. This step guides you to quickly examine if the dust or grime is merely on the Focusing Screen. After removal of the focusing screen and blowing both sides, reinstall the screen to check if dust disappears. If satisfied then Phase 2 isn’t necessary. Follow the same steps if you want to swap out the original focusing screen with a new one such as the Canon EG-D (Grid) Focusing Screen. Place the camera on a flat surface with the lens mount facing up to avoid dropping the focusing screen. I take the extra step of removing the eyecup too for reason you’ll understand when you are at this stage. I replaced my 5D Mk II’s focusing screen with an optional Grid screen. In case anyone is interested, the Canon part number is SCREEN-EGD CZ6-C218 3356B001AA as printed on the box. Focusing Screens on the 5D Mk II are slightly larger than that of the 5D so make sure you order the right item. Gently pull the attachment hook to release the focusing screen holder from the hook. When done right, the screen slightly “pops” out for easy removal. 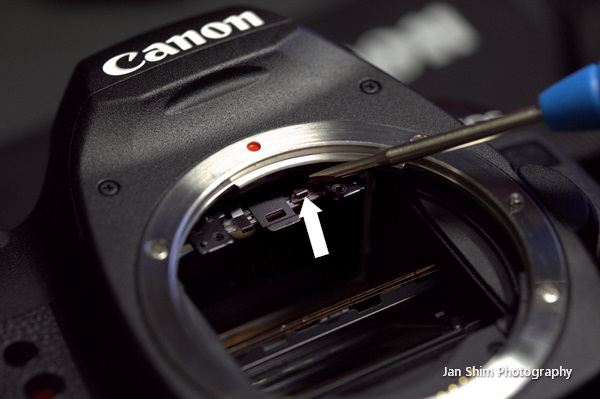 Using the Canon special tool or tweezer, removing the focusing screen is a no-brainer task. If you’ve bought a kit from Canon the box is where you can temporarily keep the screen should you require to proceed to more advanced stages of cleaning. 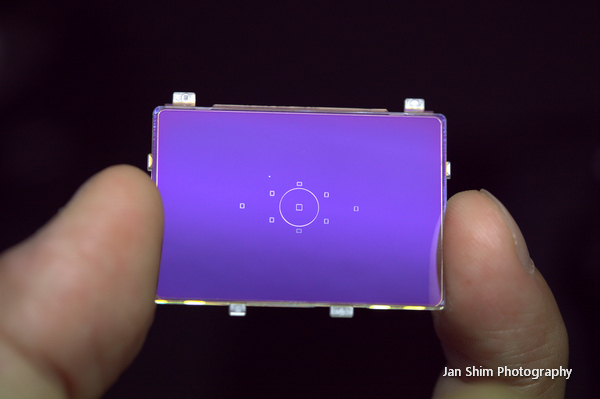 The focusing screen is extremely sensitive to touch and will smudge very easily. For the small price you pay for an optional Canon focusing screen the “Special Tool” has its use long after you’ve installed a new screen. The tool clamps the mounting tab of the focusing screen firmly and is ready to be inspection of dust or grime. Warning: DO NOT (I repeat) DO NOT at this stage use a blower on the screen just because there’s dust on it. This clamp is NOT STRONG enough to hold it against “Hurricane Katrina”. You’ve been warned. I will not be held responsible for any stupidity on your part. Ignore the manufacturer’s instructions for a moment and use some common sense. If you spot dust on the focusing screen, blow it off with a blower (I use a Giottos Rocket). I do not suggest using air from your lungs for this assignment. You do not want to get any moisture onto the delicate screen. Believe me when I say it’s delicate. I have screwed one up before and pretty much lived with my mistake until the camera was sent in for shutter replacement only then I asked for a new screen replacement. Using the smallest Philips screwdriver, remove the two micro screws that secure the metal plate. Remember to use a magnetized screwdriver here. There are no cool looking tools here except the obvious one. I used a tweezer to grab the metal plate firmly and slowly disloge it from the fitting making sure I don’t accidentally drop it onto the highly sensitive mirror underneath it. You don’t want to add a scratched mirror to your list of pain. Next comes the three-piece copper shims. These are sandwiched between the focusing screen and superimposed display each has a attachment hook that prevents them from dropping down during camera operation. The idea here is to carefully undo them starting with focusing screen, then the metal shims then finally the superimposed display screen. The metal shims come off rather easily. The final bit in the triathlon of viewfinder cleaning is the removal of each of these components. Note that you should always remember how they come off because you need to put them back in the order they were removed. The focusing screen for instance cannot be fitted the wrong way. Doing so will leave you with a blurred viewfinder. Of the three tasks, I find the attachment hook that holds the superimposed display a little difficult to remove. The idea here is to use something flat so that you can lift the catch to release the superimposed display. Using a tweezer, gently remove the superimposed display (“SD”) to inspect for dust or in this case, I discovered something more stubborn—an oil spot. How it got in there I think that’s open to a multitude of guesses. Isn’t this cool? I just placed the SD under my flourescent table lamp, tilt it a bit and suddenly the cheap plastic screen looks like expensive jewellery. Here, you can see the stubborn spot. The spot refused to budge even after given it a dozen blows. It’s decision time—wet clean or leave it be. The owner of this camera (being new and somewhat clueless and inexperienced) was :O by one lil black dot in his viewfinder and asked me for help. I took this opportunity to proceed with a tried and tested wet clean method with a purpose of documenting this procedure. Applying Eclipse methanol fluid on a new Sensor Swab (two drops). Soaking the swab with too much fluids will leave unsightly streaks on the SD. You’ve come this far, don’t let streaks (should they appear) freak you out. You can fairly easily remove the streaks with a newly prepared swab and sweep the SD a few more times. It takes practice to get things right. The point here is that the Eclipse is safe to use and does not attack the plastic. Disclaimer: The information contained in this website is for general information purposes only. No representations or warranties of any kind, express or implied, about the completeness, accuracy, reliability, suitability or availability with respect my cleaning method or the information, products, services, or related graphics contained herein are made for any purpose. Any reliance you place on such information is therefore strictly at your own risk. Just reading this makes me cringe! No way am I even going to attempt this procedure man! I’ll leave it to the pros (like yourself) thank you very much! Hehehe! Is it possible to insert the SD screen in the wrong way round? In the photo above, I see two tabs of different width. Assuming their mating slots are also different widths then it would be should be impossible to insert it back to front. can anyone verify? Thanks, Jan. My viewfinder appears to be in focus as it was before I cleaned the SD so I think it’s ok. Many thanks for the clear guide. What would be the effect of the SD being the wrong way round but everything else put back correctly? Would it be immediately obvious? Did it. Reading about it was worse than doing it. Viewfinder all clean now. Thanks for the tutorial. Don’t think I’ve got it wrong as it focuses OK. I was just wondering. I really enjoyed doing this and am very grateful for the guide. I got myself some latex surgical gloves and food-handlers’ hair cover to help reduce the chance of any extra bits of skin flakes, hair, dandruff and anything else falling in while carrying out the op. just wondering here sir..did u do for nikon to? For what is worth, I’m not offering any cleaning services. The purpose of this documentation is so you can attempt to clean the viewfinder or sensor yourself. If you don’t think you’re brave or knowledgeable enough to pull this off then I suggest you leave things alone. The methods can be applied universally to most modern digital SLR bodies. Good luck! that’s too complicated for me la….but it is very detailed and informative. Hah! So much fear! I am definitely going to try this. I was afraid of taking apart everything I’ve taken apart in my life, I’d never have learned anything. Thanks for the detailed walkthrough. This will be very very helpful. I hate those damned dust spots! Well Joe, dust is very much a part of our everyday lives, unfortunately. What I don’t understand is why the viewfinder cannot be designed with better sealing. So far I’ve only had to take the entire viewfinder apart once (excluding the penta-prism). Most of the “dust spots” I noticed subsequently are the ones caught on the focusing screen and those are very easily blown off using a blower. Someone has found the steps to be useful so I’m certain it’ll work for you too. All the best. Received this email from a photographer in Canada. Hi Jan, i wanted to say thank you for the really useful article you did on the 5d mk2 SI screen. Which begs me to wonder if i have any options as to getting rid of them ? On the 1ds mk2, one could simply tweak the options and have the square light up red only when AFing, thus having an extremely clear VF, with just the general circle. I was wondering, what your experiences were with them on the SI screen ? Are they etched in ? Thanks for your time, and i hope you’ll get enough spare time to answer my question, if not no worries and good luck on your adventures 🙂 Nice contact picture by the way. The interesting part is how they appear black inside the VF but are clear on the SI screen. Yes, the rectangles and also grid lines are etched. Hope this helps (or not). Yeah it gets very busy with the grid, that part does not bother me. But i was thinking of grabbing one of the Eg-S for some of my fast lenses and then removing the black af squares would leave the entire viewfinder much cleaner and pleasurable to work with. This would be especially nice for me when doing candids or street photography, where i don’t pay particular attention to lining up horizons and just want to focus on the subject matter. If the items are etched onto the SI, i am not sure why they are appearing black, perhaps there are some markings further into the prism ? Looking at my blog’s stats I came across a link from Fred Miranda discussing the same “black squares” issues. Any luck with your own findings? Thank you so much for this tutorial. I wanna ask you something. I try to clean my focusing screen (i have a 5D Mark II), the first one but I noticed that other screen from back have dirty “Superimposed Display Screen” i try to clean that screen with out get it out from camera but with out luck. My question is: is there any chance to change that screen from back? and if is it from where to buy another one. I talk about this screen. Thank you so much and i really need some help. My heart is broken when i look through viewfinder. Alexandru, Yes you can change out the “Superimposed Display Screen” which Canon calls Super Impose Indicate Plate and the part number is YN2–9869–000. Thanks for publishing this guide. I performed it on my 5D mk1 and the procedure is exactly the same. When I took out the SI screen, it slipped from my tweezers and I got a superficial scratch and some smaller marks on it. Fortunately it doesn’t display in the viewfinder at all! In the meantime I got some sensor cleaning materials that aren’t as expensive as the ubiquitous sensor swabs. Copper Hill Images has something called the “Sensor Swipe”: a specially shaped plastic stick around which you can wrap strips cut from PEC pads. That way it’s extremely economical to wet clean your sensor (with Eclipse cleaning fluid). I also got a sensor loupe and a good sensor brush from them, and they are much more economical than equivalent products from other brands (some charge ridiculous prices IMO). There has been a lot of debate regarding the (safe) use of PEC Pads in the place of the more costly Swabs but at the same time there has also been just as many testimonials from people who have done so for years without detriment.Before the Swabs, I used to clean my EOS 20D sensor the same way, no problems. I just haven’t so with both my EOS 5D Mark II. Hey Jan, I follow your way and screwed my focusing screen already by applying some liquid that I bought in Henry’s especially for cleaning sensor. I know, my mistake. One can’t apply it to plastics. Where to get this “Eclipse methanol” for the future references? I made it yesterday night (couldn’t help itching to get rid of the dust and grease in viewfinder) with methanol and fancy swabs from Vistek. It is not so easy as it seems, but it works. There is still a couple of tiny dust dots, but comparing to what was there – it’s perfect now, considering “night shift”. 2. a big loupe is essential for this job. 3. avoid using blower closer then three inches from the surface of an object. It can make grease spots. Great that you found gloves to be useful. Unless you use surgical gloves, most fabric ones will shed a lint or two and can be frustrating to work. Over time, you’ll find that desensitizing yourself to presence of dust spots make photography more enjoyable. These days, I usually just pop the focus screen out, give it a good blow or two and pop it back in without relying on any tools other than a good blower, of course (useful when shooting in the field). Thank you for sharing your steps. A reply to an email from Jean Claude that’s worth sharing with folks who find themselves in similar predicament. First of all thanks a lot for your blog’s tutorial .. I own a 5D mk II and I’m an amateur photographer. I’m considering new focusing screen too and I’d like your opinion about which one would you prefer and why. Looking forward to hearing from you and again thanks for all the inspiring words I read on your blog. Did the above on my 5D MKII as I had a large piece of dust/dirt work a treat although would not want to do it too often :-). Thanks a lot for this. Folks, if the information in this post isn’t enough or if you’re not convinced that the steps work, check out the How To Clean Behind Focus Screen discussion on the POTN Canon Digital Photography Forum. How would you manage cleaning the inside of the view finder window (the bit you put your eye too!!). Just come back from a gig with a bit toooo much rain and we’re all steamed up in the view finder and its just not clearing. The only thing I think would help is to leave the camera inside a dry cabinet. How long you would need to leave it there depends on how “dry” the setting is versus the amount of moisture that’s trapped inside. This method helped dry a non L lens that accidentally took a dip in the river and that took 3 days before all traces of moisture disappeared. Good luck. I’ve done this on my 50D. The only difference is there’s only one copper shim. Guess what, I’ve accidentally scratched the SI plate, and also put a bit of finger sweat! Ouch! Tried to clean it with pec pads which made it worse! I’ve now ordered a new SI plate and its on its way! Richie – I can’t figure out how to fasten the copper shim to anything in the 50D. It just flops there. No matter which way I put it back in, it doesn’t seem to fit into any tabs. Help??? Thanks! I have not handled a 50D so I have no idea what the chamber looks like. The shims in the 5D Mark II do not fasten to anything either, they (2 or 3 pieces I can’t remember) are sandwiched in between the Super-imposed plate and focusing screen (see pictures above). But having said this, the shims do not float between the SI and screen but instead have cut outs that slot into the bottom part of the chamber. Take another look (use a torch light if necessary). thanks Jan. There don’t seem to be slots in the bottom of the chamber on the 50D. Unfortunately I didn’t take note when it originally sprung out after removing the screws. It’s one shim, and it has two prongs on both top and bottom – two are wide, and two are more near each other. I feel like I’m going crazy here, because I had it back together today (but it was blurry, so I knew I put it back wrong) and I had scratched the SI plate so I had ordered new ones anyway. So I thought I’d check it out more in depth tonight and now can’t get it back together 😦 I guess there are no photos of the 50D innards online. UPDATE: I had the SI plate in upside down. It doesn’t look like the 5DII screen, it has one big tab and two others that are spaced. This is my own fault, I should write a how to on the 50D and stay out of 5D pages……. sorry! I was about to suggest that you may have either installed the SI Plate or Focusing Screen wrong way around if your viewfinder appears blurry. I have had this happen to me before from first hand mistake. It’s expected that the shim(s) have prongs on them. The bottom prongs are designed to slot into existing “compartments” to hold them in place. The prongs on top are stopped by these “catch” (indicated by the arrow) so they don’t fall out when the focusing screen is removed. After reading this I am ok with the dust specks in my viewfinder. My 30D after years still didn’t have anything in the viewfinder, but also didn’t have the option to switch focusing screens. I had a disappointing surprise when i removed the lens of my photo class’s new 5dmkII and the focus screen popped out. I’m hoping I don’t have to go through all of this to put it back into place. I am concerned though why the hinged screen holder was out of it’s secured position. Now we know why camera technicians deserved to be paid. You’re welcome. Over the years, I got immune to dirt that mysteriously creep into the viewfinder. Nothing surprises me anymore considering I have even found a tiny spec of dust inside an L lens (whether that was already there from the factory is anyone’s guess). Since viewfinder dirt do not affect picture quality it’s easier to ignore them. What a great article and thank you Jan. I have one small tiny spec on the focus screen that I can’t get off. I tried to loosen it with a tiny bit of Eclipse (with corner of swab) and the arctic butterfly brush… but its a no go. I suppose I could try it a bit more aggresive and if it damages it, I’ll just replace it with a new one clean free. With the sensor, I hesitated before purchasing the artic butterfly but I think it does help when there is a small spec of dust after the sensor’s swabed with Eclipse. Thank you so much ! Changed my focusing screen without a hitch! Thanks so much for the tutorial! Cleaned my viewfinder very easily! Thanks so much for posting this guide. Just replaced my 5d MII damaged superimposed. Btw, my 5D MKII only had 2 spacers, made of two different materials, one being harder than the other. My dusty viewfinder has been annoying me for months. Thanks for the tutorial. All worked a charm and I now have a clear viewfinder. Thanks for doing this tutorial. You’re welcome. Glad you guys found the article useful and overcame what is only difficult once. Hi Diego, over here in Asia we get our parts through Canon Service Centre as nobody else stocks them. There isn’t a CSC in my country so the nearest one is Singapore or Malaysia. You’ll have to contact one nearest to you for these things. I hope you find them without must fuss. Hi Jan. Thank you for your tips.. I use a Canon EOS 1000D. Can I clean the focusing screen on the Part 1 of your tips without remove it from my DSLR with a new censor swab (without the fluid)? I don’t know what the focusing screen on the EOS 1000D looks like. There’s a chance that on an entry level the focusing screen may not be removable in which case if you tried to clean it you may end up scratching it. i tried to clean the super imposed screen with wet cleaning method. and now the small squares that is visible through the view finder is dimmer before cleaning. i can barely see the red squares when i focus on an object. is it due to the wet cleaning? if so do i have to replace the super imposed screen?. tnx. It is entirely possible to install the super impose indicator plate in reverse. Please check and post back result. What solution did you use to wet clean the plate? If it’s sensor cleaning solution such as Eclipse, the alcohol dries up and disappears in seconds so there really shouldn’t be any wet residue left on the plate to cause the problem you’re describing. Having tried both sides I think there are no longer other ways to fix this other than replace it with a new plate. I have cleaned the plates on both my 5D Mark II the same way and have not encountered any issues although these days I tend to ignore the dirt and micro scratches on them.